Application: Introduce the content of the syringe into the fluid, which is warmed up to the operating temperature, in the tank of a power steering booster. Start the engine and provide its idle operation during 2 3 minutes. Then turn the steering wheel during 5 minutes with the engine turned on. Drive a car as you normally do. The treatment is considered complete after the mechanism has been in operation for 50 hours or after 950 miles of run. Details: Restores operating surfaces of parts and compensates their current wear. Decreases steering force. Eliminates pump howl caused by wear. Increase pumping capacity. Decrease noise and vibration of the hydraulic system pump. Improves lubricating properties of hydraulic fluid and tribilogical characteristics of couplongs. Increase operating precision of the hydraulic steering booster within 30 60 miles after application. 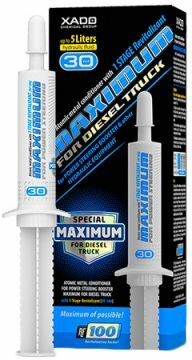 Protects parts against wear by low level of hydraulic fluid.